It’s no miracle. 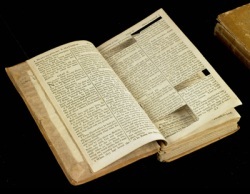 To quickly read the Christian Bible, which holds some 800,000 words, we must cut it down to its essential core.1 Luckily, Thomas Jefferson, author of the Declaration of Independence and the Virginia Statute of Religious Freedom, has done that for us – though he meant it just for his own use.2 3 Jefferson took the heart of the Bible, the four books of the gospel, and picked out just the events and teachings of Jesus of Nazareth that seemed authentic, which to Jefferson were “as easily distinguishable as diamonds in a dunghill.” With razor and glue, he cut-and-pasted those events and teachings into a blank book, and left behind the supernatural events, the explanations that a certain event occurred to fulfill a certain prophesy, and the stuff Jefferson thought injected by priests just to boost their own wealth and power. In short, Jefferson left behind the — as he put it — “nonsense.”4 And what went into Jefferson’s book was, in his words, “the most sublime and benevolent code of morals which has ever been offered to man.” Jefferson sorted the verses from the four books into time order, making one story, which he titled “The Life and Morals of Jesus of Nazareth.” Having this one flowing story should help us with our quick reading. And we might further gain readability by switching from the 17th century English of the King James Version that Jefferson used to a modern English version, such as the copyright-free World English Bible.5 So, if you have two hours and the inclination, you can click HERE and read “The Jefferson Bible in Modern English”. Thomas Jefferson’s Bible at the Smithsonian: Complete photo images of the original, plus transcription in the original King James Version. The Jefferson Bible in NIV: Maybe a smoother translation than the WEB, but due to copyright limits, is presented mostly in frames. The Jefferson Bible for the 21st Century: $1 eBook; WEB version with word-smithing by Timothy Pontious; free audio version HERE. … It was the reformation of this “wretched depravity” of morals which Jesus undertook. In extracting the pure principles which he taught, we should have to strip off the artificial vestments in which they have been muffled by priests, who have travestied them into various forms, as instruments of riches and power to themselves. We must dismiss the Platonists and Plotinists, the Stagyrites and Gamalielites, the Eclectics, the Gnostics and Scholastics, their essences and emanations, their logos and demiurgos, aeons and daemons, male and female, with a long train of … or, shall I say at once, of nonsense. We must reduce our volume to the simple evangelists, select, even from them, the very words only of Jesus, paring off the amphibologisms into which they have been led, by forgetting often, or not understanding, what had fallen from him, by giving their own misconceptions as his dicta, and expressing unintelligibly for others what they had not understood themselves. There will be found remaining the most sublime and benevolent code of morals which has ever been offered to man. I have performed this operation for my own use, by cutting verse by verse out of the printed book, and arranging the matter which is evidently his, and which is as easily distinguishable as diamonds in a dunghill. The result is an octavo of forty-six pages, of pure and unsophisticated doctrines, such as were professed and acted on by the unlettered Apostles, the Apostolic Fathers, and the Christians of the first century. Their Platonizing successors, indeed, in after times, in order to legitimate the corruptions which they had incorporated into the doctrines of Jesus, found it necessary to disavow the primitive Christians, who had taken their principles from the mouth of Jesus himself, of his Apostles, and the Fathers contemporary with them. They excommunicated their followers as heretics, branding them with the opprobrious name of Ebionites or Beggars. At seventy-seven years of age, Thomas Jefferson constructed his book by cutting excerpts from six printed volumes published in English, French, Latin, and Greek of the Gospels of the New Testament. He arranged them to tell a chronological and edited story of Jesus’s life, parables, and moral teaching. Left behind in the source material were those elements that he could not support through reason or that he believed were later embellishments, such as the miracles and the Resurrection.